Living… in Georgia with his father and son. It's a split-level brick house on two acres of land. The lawn usually needs some cutting. It's a quiet road; you can hear the crickets. He’s got barbed wire all around the place. Profession… corrections officer in the Georgia State Prison. Hank assists in executions when needed. He makes sure the condemned's last moments are exactly as they desire. In England, they used to give the condemned man a party the night before. 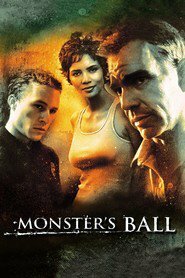 They called it the Monster's Ball. They don't have that here, but Hank thinks it's right to give them whatever they want, whether it's a preacher or a lawyer or just some peace and quiet. Interests… drinking and comforting Leticia Musgrove, whose husband is on Death Row. Sometimes Hank spends the night with her. He told her he had no problem sleeping on the couch, but she said she'd feel too strange being all alone. Hank would feel strange too. They give each other comfort and take care of each other. Relationship Status… widower. Hank’s wife Eleanor committed suicide back in '87. Since then his son has never really been the same. But now he’s met Leticia. She’s the least likely of lovers for Hank, but their loneliness brought them together. Sometimes he feels like she's all he’s got left. Challenge… redeeming himself. Hank’s father hated him and his mother, and so Hank hated his own son and wife. He thinks his son is too “soft” when he throws up and faints during an execution at the prison and beats him for it. Hank lost his wife to his selfishness, and now it seems like he’s losing his son. Personality… tough, abusive, and guarded. Hank didn't grow up with love or family. He had to learn what these things are on his own. He has never felt attached to anyone or made a real effort to make another person happy. When his son tells him that he hates him, that's when he knew something had to change. Hank Grotowski's popularity ranking on CharacTour is #4623 out of 5,000+ characters. See our top-ranked characters and read their profiles.